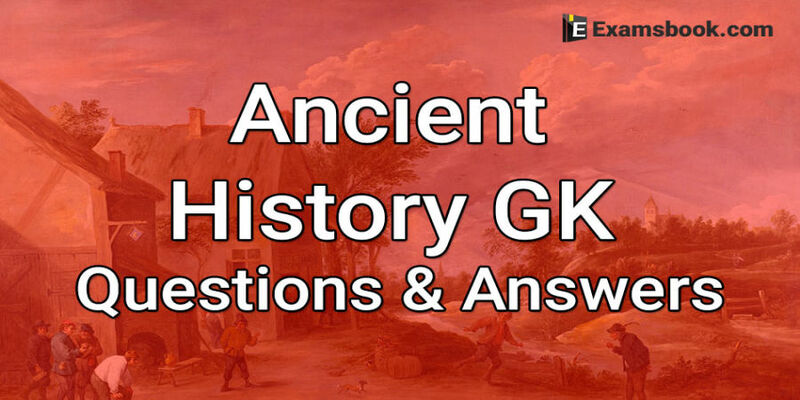 Today I am providing Ancient History GK Questions and Answers related to Competitive Exams. You can easily get 2-3 marks with the help of Ancient History Questions for SSC Exams. This post of Ancient History GK Questions for Competitive Exams is very important also related to General Knowledge Questions and Answers. I am providing you also Objective Questions with Answers of Ancient History for SSC Exams. These questions are very important for any types of Competitive exams. Very important questions Ancient Indian History GK for Bank PO, IBPS, Bank Clerical Exams, SBI, IAS, RAS, UPSC, SSC Tier-1 and all other exams. Read all the Ancient Indian history questions by choosing these blogs. Visit ANcient history questions with answers. 1. Which among the following kings was also known as Mamallan (great wrestler)? 2. Which among the following is the correct set of the plays written by Harshavardhan in Sanskrit? 3. Where and when was the second Buddhist council held? [B]Sri Lanka in 1st century B.C. 4. Who among the following succeeded Samudragupta as the next ruler of Gupta Dynasty ? 5. As per Asoka’s inscriptions, which among the following place was declared tax free and proclaimed only 1/8th part as taxable? 6. Which among the following places have given the earliest evidence of agriculture in Indian subcontinent? 7. Which among the following Vakataka ruler performed all the seven sacrifices viz. Agnishtoma, Aptoryama, Ukthya, Shodasin, Atiratra, Vajapeya, Brihaspatisava, Sadyaskra and four Asvamedhas ? 8. Who among the following was the 23rd Jain Tirthankara ? 10. Which among the following is the most unique feature of Dholavira site of the Indus Valley Civilization?